Now that table has some epic perspective right there. Or not. Anyhow. Told you I’d have a short one this week, and I believe I just might have created a running gag for the strip. 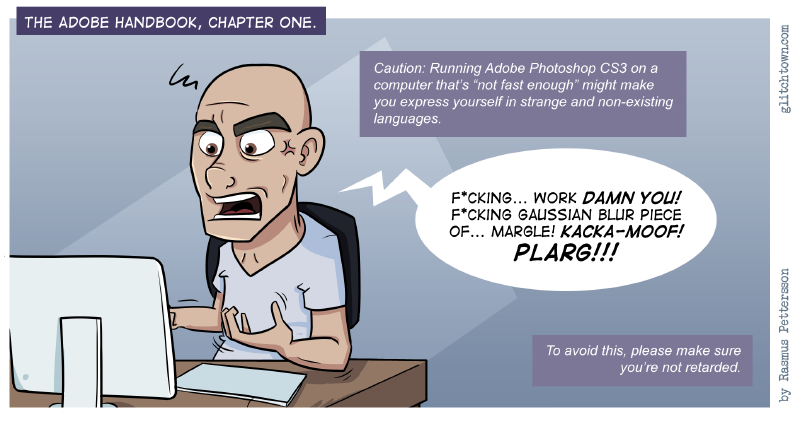 There’ll be more Chapters in the Adobe Handbook, I can assure you. Let’s just get one last thing straight, that’s just some random guy. He won’t stay in the strip, and it’s certainly not me. I’m much cuter. So, on the subject of frustrating slowdowns in Photoshop… is it just I who screams nonsense words? Sometimes I feel like running down the Adobe team with a lawnmower. This entry was posted on Monday, June 16th, 2008 at 3:39 pm and is filed under Comic. You can follow any responses to this entry through the RSS 2.0 feed. Both comments and pings are currently closed.